When you contact a new prospect or when you are contacted by one, the last thing you want is to forget some important information about your business. To make sure you don't miss it, it is better to have such information ready in advance. What follows is a brief list of tools I find useful. You may decide for a different set that works better for you; what's important is to have your own marketing tools ready ahead of time. In pdf format; probably in two separate versions: a short one (1 page), and a more complete one (no more than 2 or 3 pages). In MS Word (or whatever you used to write the résumé). Whenever you update the editable version of the résumé, you should also create an updated version of the matching pdf, to always keep them in synch. A pdf with your standard rates, including definitions of terms, currency conversion, terms of payment and so on. This should contain your rates and the definitions of the terms you use that could be misinterpreted. For example, I define what is editing and what is proofreading; I spell out under which conditions I charge a rush rate, and point out that words are counted on the source text normally, but on the target text when the work involves non-editable files or hard copy documents. Probably as Excel (or other spreadsheet) files. Again, whenever you update your rates, you should create new pdf versions of the rates sheet. If you quote in different currencies for customers in different countries, the rates sheet should include your rates in the different currencies - or you should have a separate rates sheet for each currency. If you provide quotes in different currencies but you base them on your "home" currency, show your exchange rate, and update it as necessary. You don't need anything fancy, in fact the Google gadget recently offered on Judy and Dagmar Jenner's Blog Translation Times is fine. You need the calculator for providing quick, nonbinding estimates. For drafting your binding quotes you also need a spreadsheet template customized with your rates. Any graphic files (for example, your logo) that you use in your communications to differentiate your business from your competitors'. If you have a website, include in a subfolder all the graphic files you use. Update as needed. A one-sentence description of what distinguishes you from other translators. 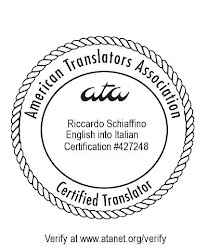 For example, ours is "We are a small partnership of experienced Italian and Spanish translators, and we specialize in providing high-quality translation and editing to larger translation companies". Keep this in a text file and use it as a template for your e-mail and other communications with your prospects and customers. Keep it short and to the point. You may need different versions for different types of customers. A shorter version of your rates, with only a few items. For example, "Our normal rates are: translation + editing USD 0.15/source word, translation only USD 0.12 / source word, editing USD 0.04 / word, and proofreading USD 38 / hour." In Outlook (and any other e-mail program you use, including Gmail and other web-mail services) a signature block that contains your e-mail address, phone number, fax (if you still use it), web site and tag line. A file with a bullet list of what you should always remember when talking on the phone with a prospect (or when you communicate with a prospect by e-mail or IM, for that matter). In the cheat sheet, remind yourself to be especially clear when spelling out your e-mail address, giving a phone number or your surname. For example, when I leave a voice-mail I deliberately slow down at the point in which I give my phone number, and then repeat it: too many people speed up and mumble exactly when they give you their phone number to call them back. Remember, if you make it hard for your prospects to call you back, they may decide it is too much of a bother to do so. For phone communications, to spell out difficult words I also keep next to my phone a printed copy of the international spelling alphabet (Alpha, Bravo, Charlie, Delta, and so on). Finally, get in the habit of using your marketing kit always: don't reinvent the wheel every time you contact a prospect or are called by a customer. Very good information. I shall try to have my kit ready. We missed you at the ATA conference and are sending our condolances! Thank you for your great tips here!!! Great information, easy to refer to. Thanks for the article.